The easiest and tastiest way to learn how to cook mushrooms is by sauteing them in olive oil. 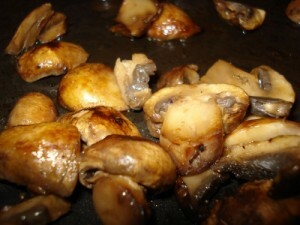 Cut the mushrooms up into bite sized pieces and throw them in some hot oil. Add some fresh chopped garlic and onions to the pan and cook the mixture until browned. If you don’t want to brown the mushrooms then add the garlic and onions to the hot oil in the pan before the mushrooms and cook for five minutes, then add the mushrooms. Some great foods that accompany mushrooms are steak dishes. Nothing is better than a rare steak with some sauteed mushrooms. There is also a large variety of mushrooms to choose from. These include portabella, shitake and the famed truffle mushroom. A good drink to accompany mushrooms is a beer, a glass of wine or even a glass of water with some lemon. Mushrooms are one of the most exquisite culinary delights. NEVER pick wild mushrooms unless you are trained in the different species of mushrooms as many of them are very poisonous.